You have slop in your bucket. 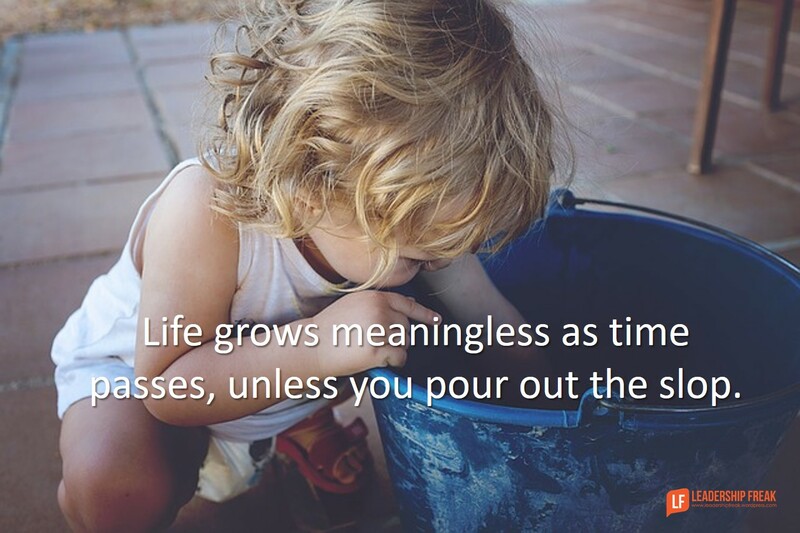 Life grows meaningless as time passes, unless you pour out the slop. The trouble with slop is it comes disguised as fulfillment. You end up carrying a bucket of putrescent slop. The weight of your bucket feels impressive. Before long it smells like crap. Repeated activities that lack long-term impact. Good activities that don’t contribute to meaningful goals. Every activity that’s disconnected from values. What’s stinks in your bucket? Pour fresh water in your bucket by asking, “What opportunities might we seize today?” Everyone who focuses on solving problems camps in the past. It’s hard to build the future when you’re always fixing the past. Work to create something new rather than fix something broken. Problem-solving centers on something that already happened. An opportunity seized is a problem solved. What opportunity might you seize today? The seduction of feeling important because you’re busy trivializes leaders. I asked Jon Acuff how to pour slop out of the bucket. He mentioned our need to feel important by being busy. How might you seek significance over busyness? Jon also suggested making a long list of everything we do. Identify the things we enjoy. Do more of that. How might you listen to joy? I’ve come to believe that learning to say ‘no’ is pathetic. It suggests we don’t have an irresistible ‘yes’. Say ‘yes’ to something so captivating that saying ‘no’ is necessary. What mighty ‘yes’ is calling you? Once it’s gone, time never returns. How might leaders pour slop out of their buckets? Wow! Timely, for me. Thanks for ideas as I consider how I use my time. Retired from a career now gives me flexibility to do some personal things I enjoy as well as use my career experience to help others. Your thoughts today tell me to question myself — am I just being busy because that’s what I’m used to? Or, am I focused on doing what reflects my values? Thanks, Dan. Thanks Alan. Your comment is encouraging and insightful. It’s easy to slip into old patterns. Many people have the wonderful opportunity you have. Sadly, they get lost in trivialities. In the process, life slips through their fingers. You have my best for your journey. Thanks again for sharing your story. Thank you for this post! I’m all for getting rid of the slop. How do I manage up to persuade upper management to get rid of the slop too? In my new position it looks like there’s a lot of busy-ness (in the form of abundant agenda-less meetings with undisciplined follow up), but not necessarily a lot of productivity. Being busy makes people feel important. Employees at every level seem to be overwhelmed by the “slop” in their buckets. Certainly I am. My initial observation is that this is possibly because upper management is not focusing themselves or their staff on big picture goals, results or priorities. There is no current strategic plan. As a manager I prefer to keep the organization’s big picture in mind and make sure my time, and my staff’s time, is spent doing the things that directly advance the organization’s goals, priorities and results. In a world where organizations are chronically understaffed and short on other resources, it just seems silly to spend time on things that don’t move the ball across the finish line. It’s a delicate situation when your supervisor doesn’t think this way, and bristles at my inquiries. I wonder how leaders might make meetings more effective, even when they don’t lead them? Leaders can ask more questions and provide fewer solutions. Be less patriarchal (matriarchal in my case). Others who are closer to the front line need to be heard – you’d be surprised how important their insight is to coming up with effective solutions! Dan, I think Leaders even if they don’t lead them are still for their expertise and contributions, so if I had to say anything, I would suggest for them to contribute to the betterment of the meetings, “enhsncment through contribution” I will call it. “Don’t be a bump on the log”, smooth out the bumps, when possible. Yeah – this is a great post…! I know I feel fulfilled when I accomplish things throughout the day, and at times some of them don’t really contribute to a meaningful goal. I like number four on choosing joy; it seems so simple. It seems simple, but I think this is a big one where everyone thinks they know what makes them happy and that they do those things, however most don’t really know how much time is spent on trivial things. I like the idea of writing it out to see how much or how little I focus on things that bring joy. Thanks Christopher. Wonderful insights. Thanks for sharing. It seems to me that joy is energy that sustains us over the long-term. It’s difficult to keep our energy up for very long if we don’t enjoy what we’re doing. Oh, Wow!, again, Dan. You should do a column on that phrase — . . . joy is energy that sustains us over the long-term. And, that joy can, and should be, simply be the result of a decision. Just like happiness. The minute we let what’s going on around us determine our level of joy or happiness, we are no longer determining who we are or our future. Thanks, again, for a powerful reminder of some uncommon wisdom. Love, joy, happiness are decisions. The irony around this is that many of us are employed as problem solvers! When problem-solving is your job, seizing opportunities to do something new/innovative/different is a real challenge. Thanks Mitch. It’s incredible that we spend so much time focused on the past. Often when we seize opportunities the problems we are so worried about become irrelevant. We should say that solving technical problems like a glitch in software code or a broken machine is an exception to focusing on opportunities. I have been receiving your blog for about a month. It caught my attention because of my passion for leadership. Just wanted to take a moment to thank you, Dan, for the high-octane quality of the content you write. It commands my respect! Thanks you Jeanie. A good word feels great. It’s a pleasure to serve. Thanks Lynne!!! I’m running for my dictionary. I’d love to reply but I feel a delicacy in articulating lest I should deviate from the ethereal hypothesis of the nebular conception of the truth. In other words I can’t find the pole of veracity. I’m confused. “I’ve come to believe that learning to say ‘no’ is pathetic. It suggests we don’t have an irresistible ‘yes’. Say ‘yes’ to something so captivating that saying ‘no’ is necessary.” Is there a missing “not?” “…saying ‘no’ is not necessary?” Or do you mean that once we’ve said Yes to something captivating, saying No to everything else comes naturally, and isn’t something we have to learn? (It reminds me of the parable of the Pearl of Great Price). I like your question Robert. I’ll be interested in Dan’s answer, also. It might be a bit of both. Dan – As always, another interesting piece. If you haven’t read a children’s book by Carol McCloud, it is worth the purchase. Title: Have You Filled a Bucket Today? A Guide to Daily Happiness for Kids. This book focuses on encouraging positive behaviors by using the concept of an invisible bucket. It is a way of expressing kindness, appreciation, and love. I showed my 4 year old grandson my imaginary bucket and asked him to fill it with happiness. I filled his and we shared it with his mom. He also told me that we should put “joy” into the bucket and that he loved me. So, let’s look for more happiness in this time of challenging leadership and tell others that we appreciate them – just say thanks. Feeling crappy this morning so this was a delight to read. I do believe there is slop in my bucket. My intuitive guidance isn’t coming on my timeframe as I ponder 3 scenarios regarding some life choices. Just before I read this post.. I heard Let It Be on the radio. so that is probably the guidance altho I “decided” it was solution time….HA! Anyway, timely post!